It is considered within the realms of “proper etiquette” to eat asparagus with one’s fingers. I consulted with “Miss Manners”, whom I consider the authority on matters such as this. “Dear Miss Manners, What is the correct way to eat whole cooked asparagus spears? Should they be cut one at a time? All at once, or not cut at all and eaten one at a time? necessary to finish it off. 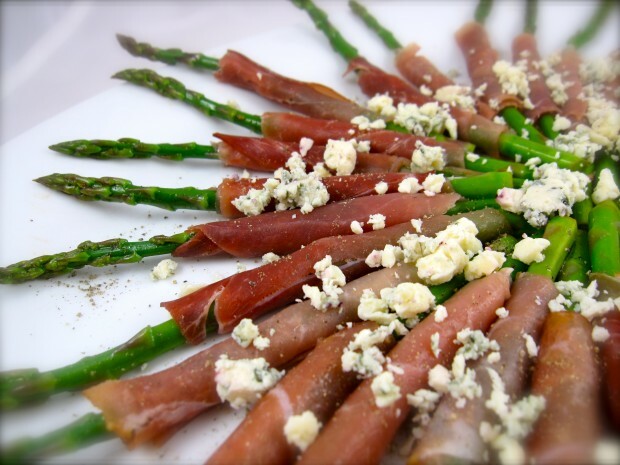 Miss Manners did not extend her advise to include the appropriateness of eating proscuitto-wrapped asparagus and blue cheese with one’s fingers. I think she would, however, approve. The sauce is not overly drippy, and you can cup your other hand under the spear to capture any crumbling cheese. Rakishly thin, new Spring asparagus are most coveted for flavor. But I would have purchased a “fatter” asparagus for heft in this recipe, if I could have found them. Bring large pot salted water to a boil. Blanch asparagus 30 seconds to 90 seconds, depending on thickness or until asparagus just bends. Drain in ice cold water. Blot dry with a paper towel or clean cloth. Whisk together olive oil, vinegar and garlic and roll and marinate asparagus in vinaigrette 15-30 minutes at room temperature. Trim prosciutto into 24, 2-inch X 3-inch pieces. 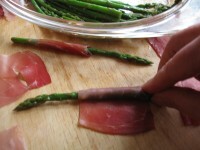 Wrap each spear with a prosciutto slice. Arrange on a platter or individual plates. Grate pepper over spears, sprinkle with blue cheese and serve. More Recipes Filed Under "Cold appetizers"